The noon Rotarians have handled the grill as far back as memory goes. Lammers’ Barbecue attendance goes back even further, to when he moved to Traverse City as a boy in 1968. He attended NMC from 1971-72, then transferred to Central Michigan University. He returned to the community to raise a family and run a business. Now, between 15-20 extended family members make it a point to attend the Barbecue every year. Command Master Chief Al Wiltse has only been stationed at Air Station Traverse City for three years, but his predecessor made sure he knew to set aside the third Sunday in May. Working the serving lines, as the Coasties usually do, is fun, too, Wiltse said. The company has been volunteering for 26 years, said Realtor Clint Wheeler. This year, volunteer Realtors Leanne and Lyle Deeren have an extra reason to show up for serving line duty. Daughter Sierra, a Traverse City West High School senior, will enroll this fall in the nursing program. Sporting their signature yellow aprons, 18 Zontans will fill two shifts in the serving lines, dishing out coleslaw, potato salad and of course the buffalo burgers. “We love seeing the people going through the line and all the happy faces,” said Zonta board member Nancy Brick. She usually volunteers as a “runner,” notifying the kitchen crew when a serving line is running low. 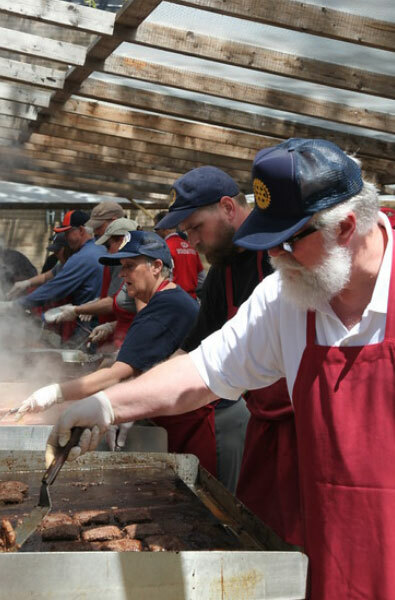 Other groups and clubs with longtime volunteer ties to the Barbecue include the Traverse City Optimists, Kiwanis, Elks, Newcomers, Traverse City State Bank, Hagerty Macy's and the National Cherry Festival. Advance tickets are $6 (plus a $1.25 online service fee) when purchased online at MyNorthTickets. Tickets can also be purchased for $6 at Oleson's Food Stores, many financial institutions and on NMC's main campus, or for $8 at the gate on Barbecue Day, May 20. Let's all do the BBQ May 20! Food and fun, family and neighbors are again on tap for the 63rd annual picnic under the pines that draws thousands to campus. Buy your tickets online in advance ($6 plus a $1.25 service fee), for $6 at Oleson's Food Stores and on NMC's main campus at Founder's Hall and in the Public Relations office in the Biederman Building, or $8 on Barbecue Day. 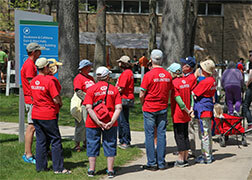 Volunteers are also needed for everything from serving lines to recycling and clean-up to children's games. Slots are typically two hours long.